Also, try the “Bartender’s Breakfast,” if you think you can handle it. Couples straight and gay were having the time of their lives at Cafe Pettirosso last week, hoisting beers and cocktails after the Supreme Court made gay marriage legal nationwide. It wasn’t even noon yet. Folks high-fived while two women a table over locked lips. Out front, a dude lay on the rainbow-colored sidewalk, flapping as if making snow angels. The Pike Street spot is one of the choice daytime haunts for Capitol Hill’scaffeine and social needs. Despite the obstacles to access last Friday — streets were cordoned off to gear up for the Gay Pride festivities — the place was as busy as ever. Dozens walked a block or two around the fences to join the celebration. On the menu are espressos, house-made Twinkies (less spongy than the Hostess variety) and a potent brew called the Bartender’s Breakfast (the Italian amaro Fernet, Amaretto liqueur, iced coffee and heavy cream, served on the rocks). “That should cure whatever ails you,” a patron said. Breakfast is served until 3 p.m. and then happy hour kicks in. It may be the only place in Seattle where you can get happy-hour eats to go — a nod to the musicians, servers and locals who have late shifts and need food on the run, one of the owners explained. The grilled-cheese sandwich with gooey Havarti and Beechers cut with onion jam is the best of its happy-hour offerings. 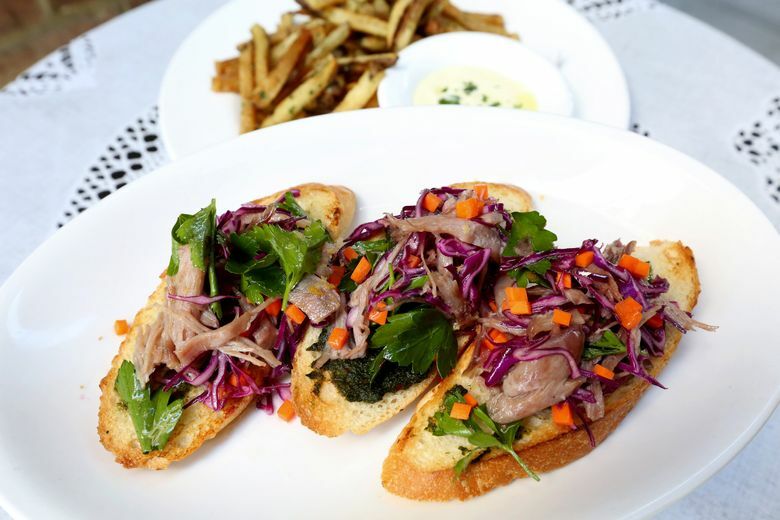 Or to share, an order of crispy fries or crostini topped with duck confit. The summer libations, some jammy and sour concoctions, needed a bit of tweaking. But $2 Rainier and $5 bubbly are what you should be drinking anyway, preferably by the airy window or in a seat along the sidewalk. Coming soon, a new dinner menu, now that owners Yuki and Miki Sodos hired chef Kalen Schramke, of the late Rover’s, Terra Plata and Kaisho to run the kitchen. Cafe Pettirosso, 1101 E. Pike St., offers happy hour 3-6 p.m. Tuesday-Sunday with $3-$11.50 snacks, $1 off on draft, $2 Rainier, $4 well drinks and $5.50 wine; $1 surcharge for happy-hour orders to go (206-324-2233 or pettirossoseattle.com).